Sorry I haven't been posting much, here. One of my last posts was at the end of July, which was partially entitled "Close to Publishing..." (somewhat amusing in retrospect). I've been adding brief updates on a more frequent basis on my Edwin Hanks, Author Facebook page, which is now up to 199 likes/subscribers (want to be #200?). The long and short of those various updates is that, after more or less completing the story, I've been adding layer upon layer of depth, receiving comments from a number of deeply-valued beta-readers, and making changes according to what they or I feel isn't working quite right. It's a refining process I intend to discuss shortly in a blog post about croissants. Previously, I've shared with you samples of my historical fiction writing. I've meant to supply some writing from other genres, but I haven't found a good sample. Now, it's time. What I have for you today is a sample from the upcoming novella, "Uprooted." It hasn't changed much, at all, in the last two months, and I surprised myself yesterday by making some minor improvements, but I don't anticipate I'll change it again except in response to comments which you can leave here. As a special bonus, you'll get to see one of the illustrations from the book! Thanks to Nicole Charpentier for doing some of the interior illustrations. The odor of damp earth and warm forest penetrated Caran’s nostrils. He lay on his side, rocks and twigs uncomfortably prickling through his tunic. A youth in his mid-teens, dressed in simple woolen earthtones, his tousled brown hair eclipsed his searching green eyes ever so slightly. He peered out from a concealing copse of trees and brush, hoping to catch sight of his prey. Caran glimpsed nothing of interest. Just the gray-whiteness of a thousand aspen trees. The clustered red of the tappery bushes. No movement but the flutter of small green leaves. No sound but the call of a hawk circling high overhead, its piercing cry sharp like its talons. A wise hunter is patient. Still. Silent. Eyes scanning. The mountains of the Burgundy Range loomed large against the distant horizon – a startling contrast of brilliant green vegetation and bright red rock, with a hint of snow dusting the very tops. Nearer, to front and left of the woods where Caran concealed himself, ran a crescent of bluffs overlooking an oxbow of the Jerat River, whose smoothly flowing waters bit softly into their base. A wisp of breeze ruffled Caran’s hair. A trio of birds flashed past, winging through the branches in chase. He continued to watch. 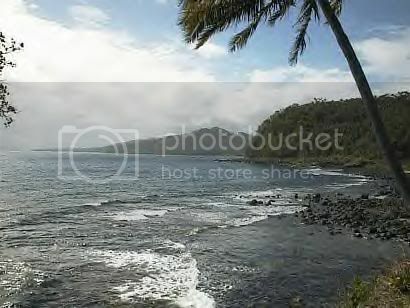 His mind drifted to thoughts of Kiya, the tall, beautiful, brunette a year his senior who occupied his thoughts often. He imagined he might now be hunting for food for her table. Their table – the one he hoped they would share someday. There! 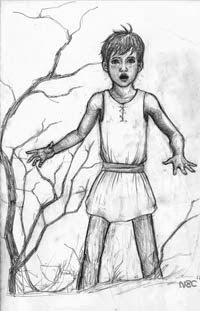 A small child in drab brown clothing stirred from a thicket. The boy’s gaze darted furtively. Excitedly. He began to move. Wrestling with entangling branches, he blundered through his first steps, making enough rustling, crackling noises to rouse a bear from slumber. Caran shook his head with a wry smirk. 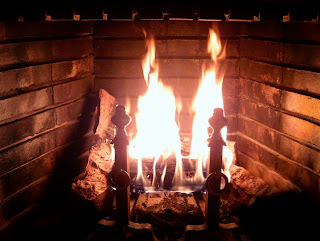 Slowly, he shifted, leaves crackling quietly under his form. He raised his bow to match his gaze. Pulling the bowstring back, he took careful aim. “Pfft…. Thut!” he shouted, sound effects pitched to carry. The boy stopped abruptly. His eyes goggled, and he stared in stunned silence at Caran’s location for a full two heartbeats. Then he dropped to the ground. “You missed me!” he yelled back. Unexpectedly, the youth stood up again. His body and throwing arm arched back and flung forward to propel some object. It landed a full twenty paces from Caran’s location. But the range wasn’t bad, he noted. As Caran considered whether to dignify that with a response, he heard a shout of alarm from across the clearing. Real alarm. Or so it seemed from the tone. Caran leapt to his feet and dashed intently toward where he had last seen his little brother. As he ran, he reached back and pulled a real arrow from his quiver, notching it for ready use. I made a lot of flavor enhancements to my story today! The story -- a fantasy murder mystery, turned chase/flight -- is structurally complete. The step I'm attending to right now is making sure the reader understands what things and people look like, has enough background to understand elements of the story, etc. And, in addition, I'm adding phrases that do nothing but add depth to the world in which the story is taking place. For instance, a flight of birds dashes through a scene. No reason for them to be there, except that, while the story is taking place, unconnected parts of every living things' life continue also. It's my hope that the reader will take this as a sign that we're not on the set of some play. We're in a living, breathing world. I'm adding background because it may not matter to readers of this story what the region's wider geography is. But it probably matters to the characters -- they would be aware of it, and it may have a deeper meaning to them than to the reader. Those tidbits, also, add flavor and immersion. Earlier this week I made dinner a couple of times. Once, I picked a German Potato Cassarole, and it was actually pretty fun to put together. We eat gluten and dairy free, so what I had to do is gather three different online recipes and combine them. Which wasn't easy -- they were very different. I've found enough of an identity as a cook that I have a rough sense of what I can take from each recipe, and what can be left out. What's more is how great it tasted! One for the books! Definitely a repeat appearance is predicted. But that's very much like what I am doing in my story, today. When I cook, it's easy enough to assemble the base ingredients -- the potatoes, onions, vegan "cheese", etc. Flavor -- what makes it taste like more than the sum of its parts -- is more challenging. I could have just used white onions. I did. But I also added green onions. One recipe called for celery, which I dislike. But I did add plenty of celery salt. When a recipe, or a story, comes together with lots of flavor, it is bound to be well received. That's the reaction I hope to get from my readers when I publish, in two or three weeks! It's been an exciting week for my fiction writing! 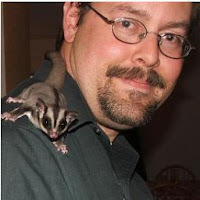 I am about to introduce you to the World of Orinthia! More on that later. The main story I'm working on is up to 8 scenes, and I'm going to add one more at the end which I felt was important. My characters must do what is necessary, because they're smart, unless there's some reason why they're not picking up on what the best action would be. So, coming to the end, it occurred to me that they would leave themselves and their friends vulnerable if they didn't undertake one last action. So I'm writing it. I've already engaged an artist for the cover art, and another artist for some interior illustrations. I have at least one published author who has offered to read the draft and provide suggestions. Once all this comes to a head, which I expect it will in a couple of weeks, I'll place the manuscript into Amazon's Createspace, and within a few days it should be available for you to read! It's amazing how the story changes and grows in depth as it develops. The story, as it is now, is nothing like I envisioned at first. As the characters went from caricatures to people, and as their intellects, motivations, personalities, etc. developed, they have changed the story. The story has wrapped itself to conform to them. And it's a much more interesting story, now. I've finally decided exactly what steps I will take to launch into the fiction writing world. My first "book" won't be a novel, nor a short story, but rather a hybrid. I will be publishing this first story on Amazon Kindle as an "Introductory Novella" -- this will hopefully whet your appetite, and get you salivating for the next elements of the series, of which there will be many, all set in the fictional, fantasy world of Orinthia. I've seen this done before. Many years ago, in college, probably, I located a book at a bookstore that had a very interesting cover -- it drew me in. 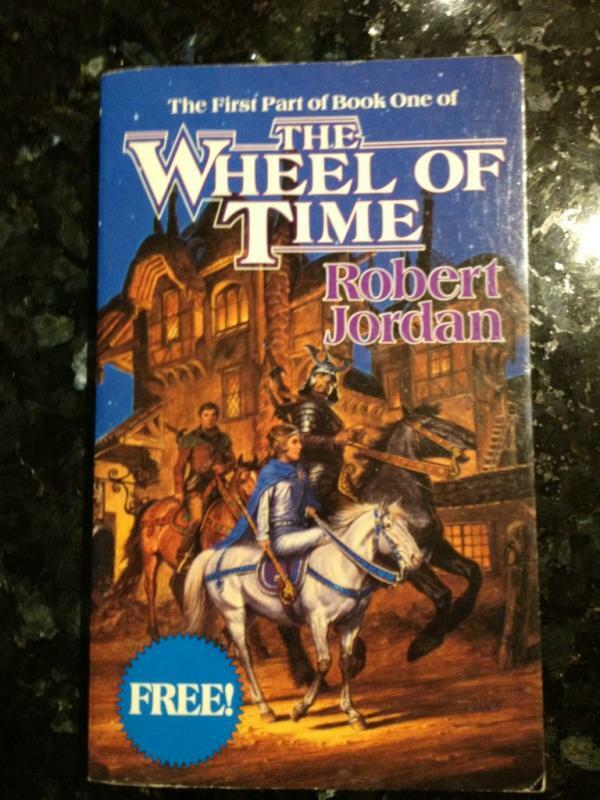 It was advertised as "the first part of book one of The Wheel of Time." Now, Robert Jordan fans know that his first book was The Eye of the World. But this half-book was only to get people interested. It worked! Many years later, I've read at least 9 of the books, and intend to catch up on the final volumes once I can find time. 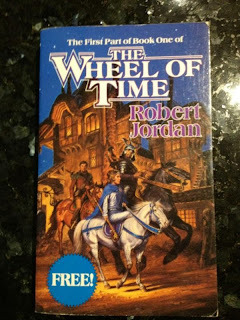 But that first book -- The Wheel of Time -- introduced me to Robert Jordan's "world." A good fantasy fiction author (and many sci-fi authors use this also) has a relatively full picture of the geography, cultures, traditions, history and peoples of the fictional world they're writing about. The more details you "know" about your world, the more enveloping the stories are for the reader. I started developing a fantasy world for a self-produced role-playing-game (RPG) about 12 years ago, and now that I'm writing fantasy novels I picked that world up, dusted it off, and I'm modifying it to fit my new needs. I'll be producing maps, "encyclopedia" articles (for my own use, so I know what I'm writing about), and other aids to how the elements of this world fit together. You won't see those materials -- they're mainly for my benefit, as an author -- but you'll sense them, as the stories develop and provide glimpses of the world and its history. To give you an idea, my first story about the world of Orinthia will be a murder mystery which later turns into a Lord of the Rings style chase for dear life. It will be available as an e-book on Kindle and other electronic platforms, and will probably be a perfectly affordable 99 cents. For those who still want a hard copy, I may also offer a 50 or 60 page print-on-demand "chapbook" for 2 or 3 dollars. After that, I have plans for many more fantasy stories set in Orinthia, which will help flesh out the people and history of this richly detailed planet. You'll see kings and queens, as well as powerful magicians (mages) and seemingly helpless mere peasants, all thrown into an interactive cauldron of turmoil. Achieving survival, or even success, in such situations as these may seem daunting. But these stories show that the human spirit can persevere against just about anything. I'm also not limiting myself to the fantasy fiction realm. Actually, most of what I've written online (not "published," per se) has been in the "alternative historical fiction" genre. I take a time in history, and subtly (or drastically) change things, so that history develops differently from the history we're familiar with. This always provides interesting stories, and the side benefit is you'll get to see many historical people -- personalities you may know from our history -- set into these alternative worlds, where they will use their own talents and predilections on a set of problems they never faced in our world. Furthermore, I'm also writing various science fiction stories -- one series in particular about space pirates -- and a set of fiction stories based on my experiences in Civil Air Patrol Search and Rescue in the 1980s. I'm really looking forward to this. I hope you are too! It's been a weird weather week in Denver. Yesterday it went from quiet and dry to monsoon in about 10 minutes. Splash & dash... then it was gone. We own a lovely 1997 Saab convertible. It's popularly known as "The Goose" because the 900 SE looks like "goose" when spelled out. My wife wanted to drive it today, but this morning was cool and she doesn't deal well with that. I ended up with the Saab, which I couldn't have planned better. There's nothing I like more than zooming around in cool weather with the top down. I left Downtown Denver just in time today. It was spitting rain, but never caught hold. I drove fast, and broke free, like I was trying to cheat the weather. I should have known it would catch up. I was clipping along the highway with the top down, the music up, feeling the wind, and enjoying the 360 degree view when I noticed what looked like severe weather off in the distance, to my left. Were those funnel clouds? 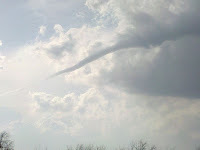 Little twisty hooks, hanging down from the clouds? Just being around thunderstorms gets my jazz up. My heart beats faster. Imagine the joy and excitement I felt from the experience! It was Heaven! But I was so fixated on the possible tornadic activity to the east that I didn't see the wall of water I was about to drive into! Already drenched, from just a few seconds in the downpour, I pulled over, put the top up, and started drying the seats. It occurred to me that, as a writer, I can't make stuff like this up. I mean, I can. But it wouldn't be this perfect. The wonder of God's world, in all its splendor, is difficult to capture in mere words. And yet we try. I became more humble, as a writer, today. I will try to imitate the Creation. But my creation is just a replica. Nevertheless, I think He smiles when I write. To paraphrase Eric Liddell's character, from Chariots of Fire, when I write, I feel His pleasure. Here's another sample of historical fiction writing by Edwin Hanks. I'll get to the science-fiction soon. This is primarily a dramatization of a historical event, character and emotion added. What I found most poignant about this is the bond of family between these several great figures of state who had their own countries to run, and widely varied interests. Later that evening, Victoria took a turn for the worse. Her closest family were assembled, including the Kaiser and Bertie, the Prince of Wales. They both knealt there, the Prince her Son on the Queen’s right, and Willy, the Emperor and Grandson, on her left. Alexandra, Princess of Wales, stood nearby, or sometimes sat. She, the Danish expatriate, had placed her animosity toward anything Prussian aside for the time being, but still seemed unhappy for reasons unconnected to her mother-in-law’s ailment. Other than the Queen, whose majesty was unfairly diminished by her condition, the gravity of the room tended toward the Kaiser, whose strength of character and utter devotion to his Grandmother stood out from the rest. Victoria made a gesture to her ladyservant – an unspoken language driven by long intimacy. She said aloud that she would help the Queen sit up, who then nodded, approvingly. The Kaiser helped hold her up in bed as she rose. Victoria took a few ragged breaths, and seemed somewhat relieved, but then became suddenly anxious. Her hand worked, as if to say that she wanted someone to hold her – a certain connection to this world. Willy grasped her cold hand firmly, and enclosed it as if to lend his warmth. The Queen’s breathing eased. But she still seemed vaguely uncomfortable. “Allow me, Grandmama,” Willy said as he reached for a plumped pillow and placed it behind her. Victoria settled back onto the cushion, and seemed glad for it. “I… Some air,” she rasped, with what seemed the last of her own. “Of course,” Willy said. 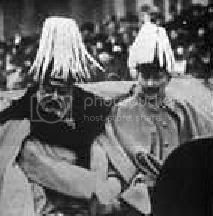 Bertie seemed as if to start awake when the Kaiser turned from his place and proceeded toward the window. Alexandra creased her brow, wondering what he was up to. Willy seemed taken aback, and he blinked. He chuckled, good naturedly. “I am perfectly capable of opening a window myself,” he said. “But thank you, my kind sir.” At that, he returned to his chair beside the Queen while Sir Thomas wrestled with the aged window to admit a measured portion of the cool evening breeze. It seemed to improve her temperament, and her strength seemed to rally a bit. Victoria smiled weakly, and nodded her head almost imperceptibly. Wilhelm leant back, again, watching her, caressing her hand, waiting to meet any further needs she might have. Late on the evening of the 23rd of January, 1901, Victoria, Queen of the United Kingdom of Great Britain and Ireland, Empress of India and all the Realms of the Empire, quietly passed away, bringing to a close the era which quite naturally bears her name. Her funeral was scheduled a few days later. The Emperor Kaiser Wilhelm II rode side by side with the Prince of Wales behind the Queen’s casket. * It should be noted that a great deal of the story here recounted is actual history, including the behavior of the Kaiser, as recorded by those who were present when the Queen died. I am grateful for The Oxford Book of Royal Anecdotes, edited by Elizabeth Longford, for many of the verbatim quotes and accounts. I did try to remain as close to the actual history as possible, though surely in the interpretation I have strayed somewhat.